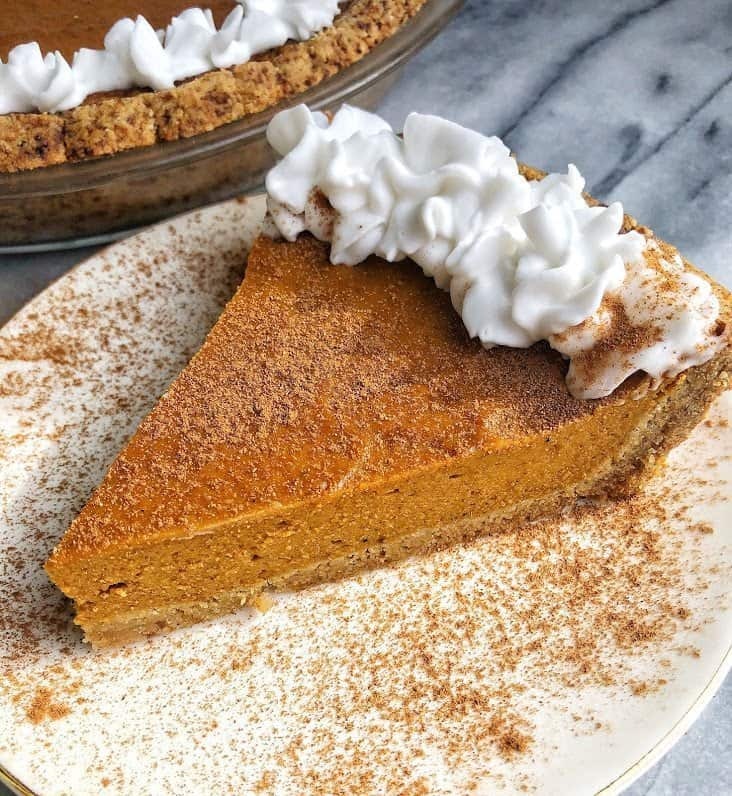 Healthy Paleo Pumpkin Pie made with and almond flour crust and natural sugar! This simple pie is quick to make and will be the perfect healthy thanksgiving pie for your table! OH YES. You better believe I’m about to come at you with one of my favorite recipes I’ve ever made for the blog. YUP! Just in time for the holidays (did I really just say that?!) and for all things pumpkin flavored. I seriously can’t believe we are already thinking about the holidays, but I also know how freaking delicious this pie is and how certain I am that you need it on your holiday table. So for those of you who don’t know why this pie would be considered paleo, it’s because it has no dairy, no white sugar, and is made with a gluten free crust. The crust recipe is so simple! I used to be so intimidated by crust, especially gluten-free, but I’ve finally found my go-to recipe that I am able to use for anytime I need a paleo crust. Most original recipes for pumpkin pie call for evaporated milk and let me just say that that stuff scares me. I never really understood how or why it was called evaporated milk because it literally just tastes like thick sugary milk, nothing evaporated or liquidy about it. 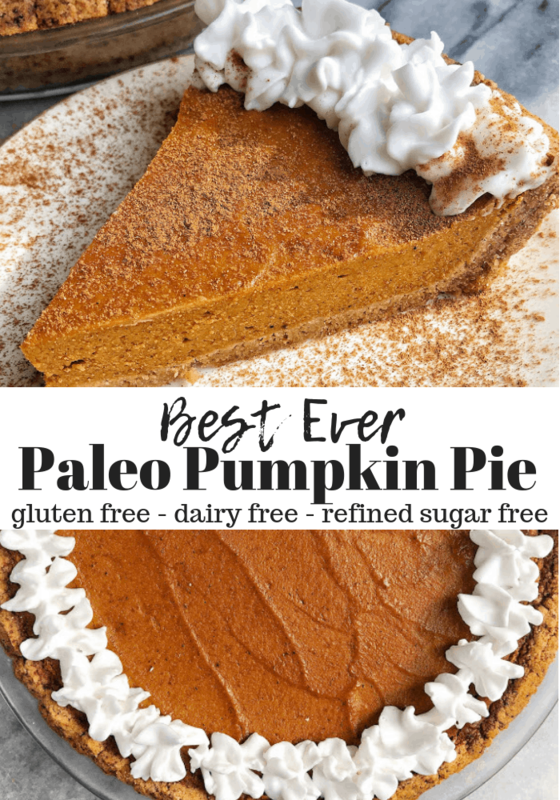 I replaced the evaporated milk with coconut milk, and swapped out a few other ingredients in order to make this pie paleo. 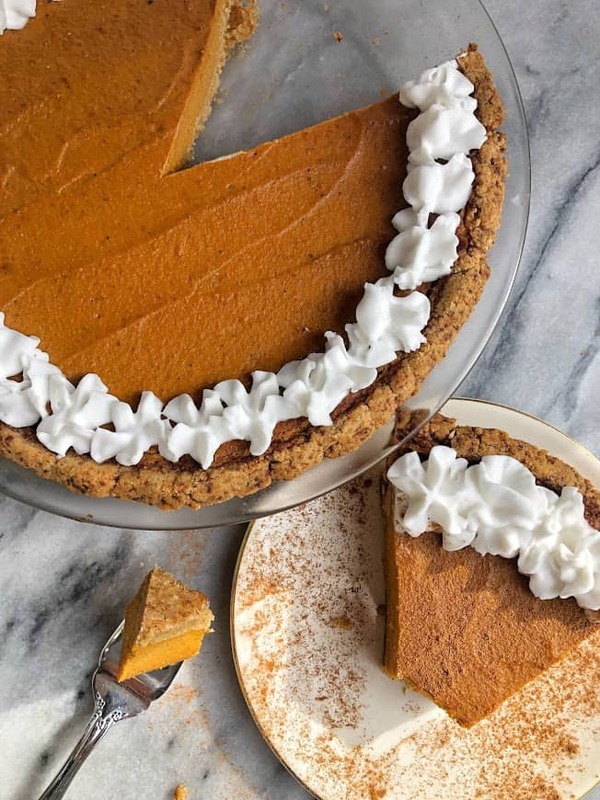 Let’s just say that no one would ever have any idea that there was a difference between this pie and the regular pumpkin pie. Like not even the slightest clue. Not even the “Erin…Did you make this pie ‘healthy’…” Trust me on this one. 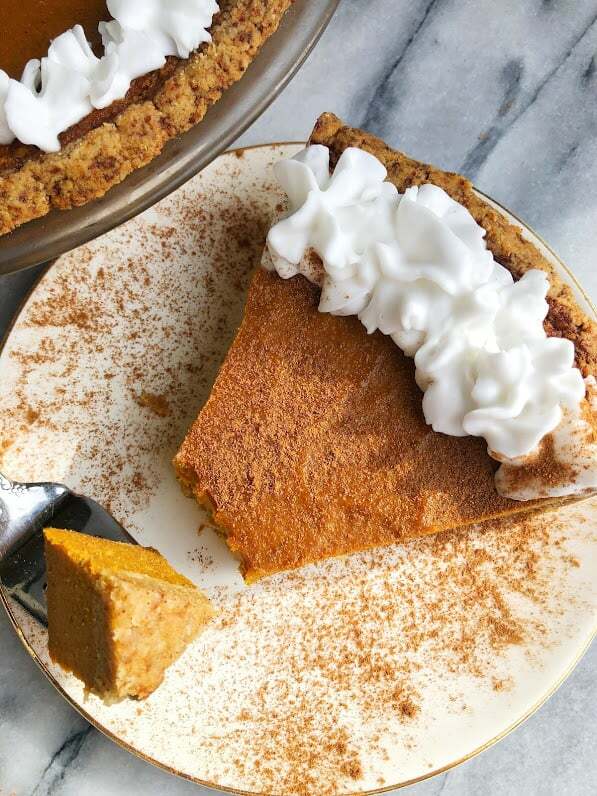 The texture comes out the exact same as regular pumpkin pie, and the flavor is absolutely spot on. I was seriously proud of myself for this one!!! So what’re you waiting for? Time to get baking! 3 Tbsp coconut oil melted. 2/3 cup coconut cream OR top of 1 can of coconut milk (just the hard part that settles at top of can after being refrigerated overnight or for 4 hours. You want it to be hardened or very thick cream) I get mine from Trader Joe’s – they have both the milk and the cream! Heat oven to 350F. Prepare + grease an 8-inch pie dish. For the crust, mix together almond flour, baking soda, cinnamon and salt in a large bowl. In a small bowl, whisk egg, coconut sugar and coconut oil. Add wet ingredients to dry and mix until completely combined and ball shape forms. Form into well greased pie pan. Start making the pie filling by adding all ingredients to a food processor. Blend together until completely smooth. Pour pie filling into the raw crust. Bake for 45-55 minutes, if edges start to brown, cover them with foil. Take out of oven once center has cooked – it is okay to be slightly jiggly, it was set as it cools. Let cool completely before serving and if prefer chilled, place in refrigerator. Store on counter or in fridge for up to 5 days. Can I substitute whole wheat flour for the almond? You can try! I recommend almond flour, but if you want to try – use about half the amount. Also might be a good idea to research a whole wheat coconut oil crust recipe! I bet there are many. You could try – you may need less! So essentially does the recipe call for 2/3 cup of coconut cream? I think that will work – essentially the same idea. 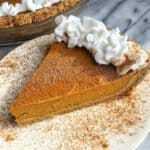 Can I use pumpkin pie spice in place of the ginger, nutmeg, and ground clove? Does the coconut cream need to be cold/hardened? Thanks! It doesn’t need to be cold, but it shouldn’t be liquidy – I would just throw it in the freezer for 45 min and then scoop out the top part! !